Who will pay for this? My ancestors did not have any Slaves, and slavery was ended 150 Years ago. So who are the slaves that will be getting the money? answer number 1: you and me and the rest of middle america. answer number 2: The minorities who are under the thumb of the democrat party will be receiving the money. Yea. It WON’T be the arabs who often were the ones who were CAPTURING the Africans and making them slaves, paying. IT won’t be the DEMS< who were the party OF SLAVES paying.. it will be you and i. Well gee I guess my family will benefit from that fund, my ancestor was made a slave when he migrated from Germany back in the early 1800s his owner was Anthony Johnson a black person, my ancestor was white. Yeah slavery endedover 150 years ago and yet from the way these so called politicians are going on about that you would think that people were still slaves today in the country. Be sure to penalize the different tribes in Africa. The ones that captured different tribes & turned them over to the “slave” ships. These slave ship captains had help getting slaves. They didn’t do it by themselves. This is just another Pigford Treasury raid – good as long as others take the paper that’s grabbed. As all Leftists, Senator Booker is extremely generous with other people’s money. My ancestors immigrated to the northern U.S. from the UK and Finland circa 1900, and they worked and assimilated and lived their lives with absolutely zero slavery. I will look forward to joining the nationwide class-action lawsuit. I’ve yet to see my full family ancestry, but most of my kin were from north europe/england. We’ve never ever owned slaves, nor would we ever want to.. Hell, i’d love to see a PUSH TO PUBLISH a list of everyone living here, who’s anccestors DID own slaves.. and i’d bet 85% of them would all be related to current demon-rats.. I agree ! My family never owned any slaves either, so WHY should I have to pay for something that I had NO part of ? Another thing, is Corey planning on collecting money from the BLACKS, that actually DID own Slaves ? Knowing Corey, he’s probably only seeing WHITES as to blame for slavery.. the world over. Thus he’d only be pushing to force Us whites, to pay. Here’s an idea “hardheaded”… lets pay …EVERYONE… in washington minimum wage with a time clock in every building, dedicate all the pension money to the cause then place a “special” tax on congress wages until the obligation is fulfilled. Put that in the bill ..Mr. (no problem spending taxpayers money) Booker! After all… these liars all campaign on “I just want to give back to the community”… Put your money where your mouth is. Reperations? For what? Taking them from the *** countries they would have ended up growing up in? Living in countries where they would struggle every single day just to find food or not die from disease already eradicated in the United States? Oh, and exactly how much illegal drugs can 500 to 2000 per year just handed to you buy these days, because you know that is what it will be spent on. Either that or 500 dollar sneakers. This is pathetic. If you give reparations to these people then you will end up having to give them to the japenese as they were in internment camps during WWII or to the Irish as they were taken advantage of when they migrated. How about the Indian or the Pakistani population? Are we going to then throw in the American Indians as well? Their lives are not pleasant on those reservations. Where does this stop? The answer is that it won’t. Free handouts never do. The dems will continue to use them to buy votes, just like they do with welfare. Hell, what about whites who were slaves to the romans for a long time. OR peole who were enslaved by the persians? IF you go back in time far enough, everyone at one time or another was slave to someone else..
Been paying reparations all my working years only it is called welfare plus taxes to pay for their riots and higher insurance to cover the building they burn during their rioting. 10 stars for this post! The concept is awful, but the idea of the study is pretty good. I’d add that the study will be funded 100% from non-govt funds, donated by individuals who have their names published. The mighty Left will donate in droves, and we can see who actually believes in this stuff. To spend taxpayer funds, mostly likely borrowed from our children and added to their debt, is about as morally repugnant as anything I can think of. I look forward to those names and to seeing the great “moral” arguments to hitting up my children for reparations for something they had nothing to do with and that their ancestors may have played a role in ending. My one suggestion — make sure that today’s Democrats pay treble damages in reparations since it is their party that ran the slavery industry and it is the Republicans that stopped it. left wingers are notorious for not donating money unless it is to a political campaign. Just like they are, by far, the worst tippers. I forgot whom it was, but i did see one of those youtube type podcasts, where someone actually polled over a thousand restaurant workers, to find out whom was the best tipper, which city was good etc.. AND EVERY ONE OF THE TOP liberal cities, were worst on the list..
Mr Booker is a wild eyed idiot! Well he is a democrat, so…. cant we just remove this people from america. 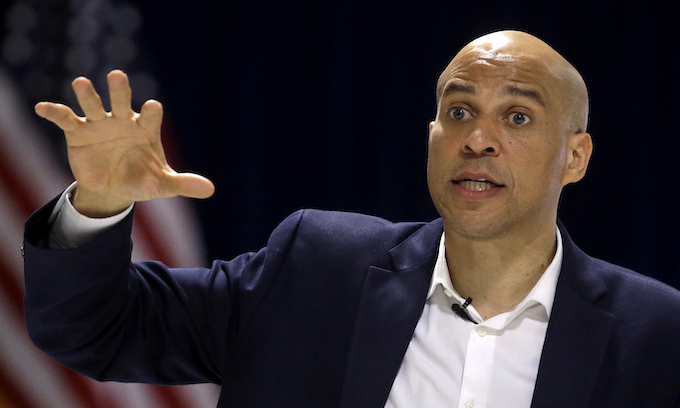 Mr. Booker’s claim of the wealth gap between races is a non-issue today. Mr. Booker is in the upper percentage of wealth gained and he did not get that way because of his race, or his ancestors’ past. He became who he is by taking advantage of the educational system that is available for everyone. The only caveat was that in order to capitalize on that system, he had to apply himself and study. That goes for everyone. The dropouts, slackers, and militant resisters of education will never make it in society today. Education, Mr. Booker, is the key and you are the proof. No amount of reparation will work if this key is not utilized. A free pass, a free lunch, and free money never lasts, it only exasperates the personal problem of not having the will and passion to succeed. This will breed a race of welfare expectancy, instead of a race of societal contributors that this country was founded on. It is a blatant, obvious attempt to buy votes. Too many are leaving the Democrat plantation… something has to be done! Promise the moon (but deliver nothing)! Don’t ever say it won’t go nowhere. DEMS keep proving us wrong. Here’s an idea. Those of you wanting “reparations” for something that never happened to you have a choice. If you take this check, just know that the money will be used to send you back to whatever country your ancestors came from and you will never be allowed in the United States again. Or…..you can give the check back and stay in America. My question sir IS HOW MUCH STUPID CAN YOU FIT IN THAT BALD HEAD? I worked 42 freaking years, paid my own kids tuitions, widowed at 43 with 3 kids. Never ask for crap. You people want reparations from me??? Nah! Get off your dumb butts, quit making ******* kids, get a job and earn your own damn money. So called slaves none of you are. Never owned a slave in my family history. I don’t owe a damn dime to FREE LOADERS!!! GO TO HELL. Never ask libtards, how much stupid they can get.. THEY ALWAYS surprise us with being STUPIDER! Because a lottery mentality, free stuff or xtra paycheck will solve their problems? Wealth is a process, not an event. Blacks are the most recent group to be slaves, not the first. Everyone has slavery in their ancestry. Do they all get paid, or just certain people? They were already slaves in Africa. At least Americans bartered and paid for them. Europeans stole them from Africa. The first slave owners in America were black. And there were thousands of them. Do their decendants get paid too? Dems were/are the anti-civil rights party. Promise everything, deliver nothing for votes. Decreasing morality and inteligence in society is part of the problem. He is going to restart the civil war. If he thinks pirating all of our money to pay off protected class peoples is a good idea then he is a fool or worse. My ancestors were kicked off their land in the first and second American gold rushes, we never owned slaves, and now I am supposed to fund this latest theft of my future? I think not. So SAD! Democrats are IDENTIFIED as the “Party of Welfare”. It’s really a case of “slavery”. Dems ENSLAVING poor Blacks. Lazy Blacks. The promise of GIFTS for their votes. Blacks who think that “Whites” have been enslaving them since 1850, or so. When it was a REPUBLICAN, WHITE Government who FREED them from slavery. Remember the “Emancipation Proclamation”? White men, seeing the necessity to act, FREED Black (and White, btw) slaves from plantations in The South. Indeed, SLAVERY is WRONG. A SIN. But now, the Democrats want to ENSLAVE the middle class working population into “REPARATIONS”, for something they didn’t DO. President Trump is REALLY freeing Blacks from poverty and joblessness. I think most Blacks REALIZE this, and will tell the Liberal/Socialist (Democrat) candidates “bye bye”. I hope so. This has to STOP. God Bless America! God Bless President Trump! Think you got the majority of what you wrote correct but your statement in quotes is just hyperbole advanced by the dimwits of the left who try to make everything they champion an absolute. If one is a slave to the love of Christ is it a sin? That is what it is all about, not doing harm. A foreign concept to the left who could not care less who they harm as long as they get what they want. Brings to mind the title of an old AC~DC tune….Shot down in flames. But keep trying to wrangle in those voters Spartacus. How have you spent that whopping $5 mill you raked in in campaign contributions recently? Run Cory, run! I am just wondering, what dunderheads, gave him 5 mil! If they have that much money to waste, send some my way! Cory Booger is an idiot and every time he opens his mouth he proves it once again. Legislation that legalizes the purchase of minority votes and funds this criminal activity and the same time. Brilliant! Spartacus is another left wing nut, like Kamala Harris & Sheila Jackson Lee, to name a few of the ignorant greedy scum suckers who happen to be black. All the slave owners, who were democrats, are dead. You want reparations, get it from the democrats. Alternatively you are free to go back to your native country, where you will wear a breechclout and fish your breakfast out from under a rock, instead of going to McDonalds for a big breakfast with your EBT card. BUILD THE WALL, DEPORT THEM ALL, MAGA, OR ELSE!!! Apart from the BIG PROBLEMS of who will be getting paid the reparations [as there were: 1) white slaves 2) black slave owners and 3) non-white or black slave owners and ex-slaves that became slave owners] this is just POLITICAL POSTURING! Even if a bill to pay reparations is introduced it is UNLIKELY to pass through the Senate (probably will make it through the house) and even if it somehow passes the Senate President Trump is very likely to VETO it. All good points. But the whole idea has become a litmus test for the Democrat hopefuls attempting to get the democrat nomination. They all said they would sign the bill if it were presented to them as president. That’s at least one thing i give dems credit for. EVEN IF THEY KNOW It has no hope in hell of passing, they still try and push for it. the lame chickens, in the GOP< often won't even VOTE on it, unless they are sure it will pass. What RIGHT does Cory Booker or any one else in the government have to take taxpayer’s, people who had absolutely nothing to do with slavery, money to hand out to people who were never slaves? My great uncle was killed in the Civil War fighting on the side of the Union to free slaves. Nobody in my family ever owned slaves and I detest the fact that my tax money might be used to make reparations for something neither I nor my family had any thing to do with. This will be nothing more than out-and-out EXTORTION! It is simply payments for votes. dems are using this to buy the votes of those they will be giving the money to. THEYVE ALREADY BEEN PAID MORE THAN THEY WERE EVER WORTH. By every economic and social measure, private property owned, education attained, black people have lost more in the last sixty years from Democrats helping them than from any other cause and now they want them to lose even more. Throw off your shackles and claim your freedom from all the manipulation from their promises by standing for yourself. Slavery was terrible but still is taking place by Muslims in the world. Otherwise they would probably be living in a village in Africa enduring the hardships that those people currently living in Africa have to put up with today…..and in North Africa and the Sub Sahara now days…. they STILL have to worry about becoming a slave and being sold to someone especially if they are female.. Put together a commission so it can determine the idea is totally unworkable and asinine to consider repartition to someone who was not directly involved in a situation. And, reparations are paid for slavery who comes next, the Chineses, Irish. Italians, Native Americans above and beyond what has already been done. As libtard mueller is, i’d not trust him to investigate who ate the cookies, WHILE THAT PERSON had some in his mouth.. Anyone who has been a Black Slave in America, Hold up your hand! But Cory related to being Spartacus. Doesn’t that make him a slave. See where he is going with this? A slave to the romans. So maybe he should go to italy and demand they pay reparations. The only reparation I would support is a one way ticket back to your home country of Africa. If you accept it you don’t come back, you refuse then shut up. Who will pay for all the Cajuns yanked out of nova Scotia in the 1700’s and deposited along the eastern seaboard all the way down to the Caribbean?